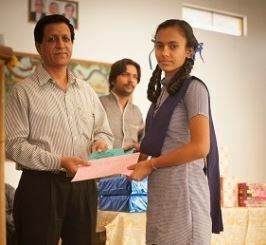 Radhika, a young student sponsored by The First Group who is enrolled at the Sandipani Muni School in India’s Uttar Pradesh region, has been awarded a special prize for her academic efforts and for topping her class in terms of attendance and behaviour. Radhika, who is entering Year 10 this term, is a beneficiary of The First Group’s charitable donations to the Food for Life Vrindavan Society, which administers support to students at the Sandipani Muni School. Food for Life Vrindavan is a humanitarian aid organisation that supports the poorest communities in the Vrindavan area to the south of New Delhi. It provides education for more than 1,500 children enrolled at Sandipani Muni School and also distributes around 66,000 meals and provides basic medical care to around 1,000 people every month. The First Group’s charitable donations help to pay for vital food and educational supplies for impoverished children enrolled at the school and elsewhere in the region. Applauding Radhika’s achievements, The First Group co-founder and joint chairman Danny Lubert reiterated TFG’s support for charities that strive to give disadvantaged children a better life. “By improving the wellbeing and prospects of today’s children in need, we can offer them a better tomorrow and we are fully committed to these humanitarian causes that offer deprived youngsters the chance of long-term security and stability,” he said.